Viewed along an axis joining any pair of C vertices of the disdyakis triacontahedron, its 60 vertices are shown to be arranged similarly, although not identically, to the triangles in the Sri Yantra. The projection of the ten triangles and five 6-sided polygons formed by these vertices onto the equatorial (XY) plane of the polyhedron generates 42 vertices and four pairs of intersecting triangles, comparing with the 42 tips of the four pairs of intersecting triangles that surrounding the central one in the Sri Yantra. There are 46 vertices on either side of the equatorial plane that are arranged as pairs, with one vertex directly above the other. The 23 pairs consist of a diametrically opposite pair of C vertices and 22 other pairs. They correspond in the polygonal Tree of Life to the 23 pairs of hexagonal yods on the 23 edges of its pair of dodecagons. The 23 pairs of vertices or hexagonal yods symbolize the 23 pairs of chromosomes in the human cell. The Godname YAH prescribes the number of polygons, the Godname EHYEH prescribes the 41 vertices of the 33 triangular sectors of the eight types of polygons and the Godname ADONAI prescribes their 66 edges. The (240+8) roots of the superstring gauge symmetry group E8 are encoded in the 15 polygons as the 240 geometrical elements surrounding their centres, of which there are eight independent ones, the others being their mirror images. The counterparts of these elements in the polygonal form of the Tree of Life are the 240 hexagonal yods that surround the centres of the seven separate, regular polygons. Constructed from tetractyses, the eight types of polygons formed by the vertices of the disdyakis triacontahedron have 206 yods. 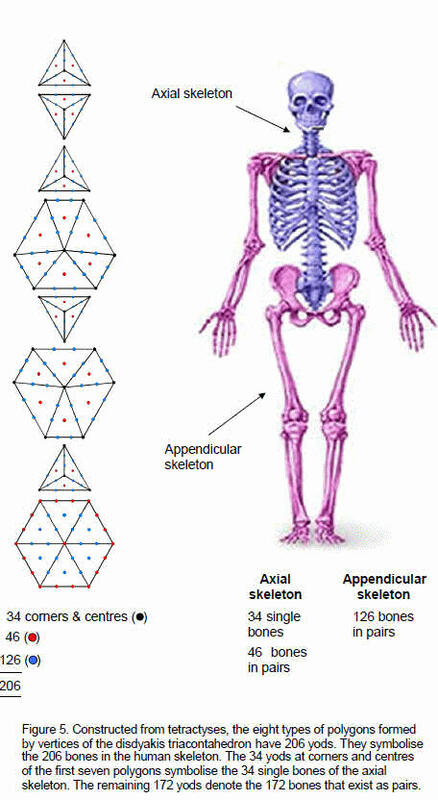 They symbolize the 206 bones of the human skeleton, the 34 corners and centres of the seven polygons above or below the XY plane denoting the 34 single bones in the axial skeleton. The disdyakis triacontahedron embodies the number 137 associated with the fine-structure constant as the number of vertices in the polyhedron and 15 polygons when the 60 sectors of the latter are divided into three triangles. When these triangles are turned into tetractyses, the 15 polygons have 840 yods other than polygonal corners. They symbolize the 840 circularly polarized oscillations in an inner or outer half of each of the ten closed curves making up the E8×E8 heterotic superstring. The archetypal character of the polygons is confirmed by the equivalence of their yod composition to Plato’s Lambda Tetractys, whose numbers have been known for over 2000 years to have as their proportions the tone ratios of the notes of the Pythagorean musical scale. This equivalence extends to the central hexagon in the XY plane. 1/φ2 = 1 – 1/φ = 1 – (φ–1) = 2 – φ. 1 + tan2α = 1/cos2α = 1 + (2–φ)2 = 1 + 4 +φ2 – 4φ = 6 – 3φ = 3(2–φ) = 3/φ2 . 1 – cos2α = sin2α = 1 – φ2/3 = (3–φ2 )/3 = (3–(1+φ))/3 = (2–φ)/3 = 1/3φ2 . y = rcosβ, z = rsinβ, and r2 = y2 + z2 = R2(cos2ψ + sin2ψsin2θ). where x, y & z are listed for each vertex of the disdyakis triacontahedron in Table 1 of Article 25. The new coordinates are listed here in Table 1. Table 2. Gematria number values of the ten Sephiroth in the four Worlds. The Sephiroth exist in the four Worlds of Atziluth, Beriah, Yetzirah and Assiyah. Corresponding to them are the Godnames, Archangels, Orders of Angels and Mundane Chakras (their physical manifestation). 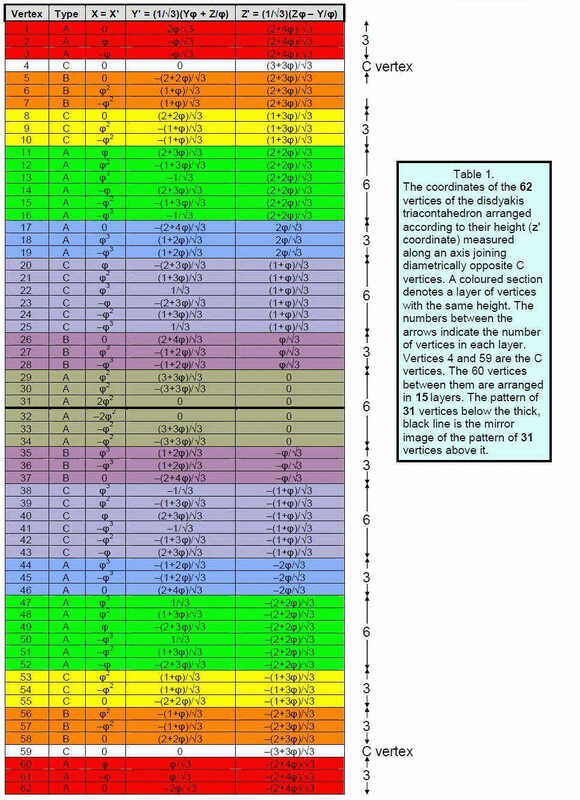 This table gives their number values obtained by the ancient practice of gematria, wherein a number is assigned to each letter of the alphabet, thereby giving a number value to a word that is the sum of the numbers of its letters. Numbers from the table are written in boldface in the article. layer of six vertices) creates four different pairs of intersecting triangles. There is nothing in the projection corresponding to the downward pointing central triangle, although it may be argued that the C vertex formally plays its role, being the starting point for the generation of the polyhedron, just as the triple Godhead symbolised by the innermost triangle in the Sri Yantra is the source of all manifestation. the XY plane, whilst the two others in the lower half of the polyhedron are the inversions of these. When projected onto the XY plane, they become two polygons, one the mirror image of the other. Hence, there are 42 vertices of distinct polygons. This is the number of triangles in the four layers of the Sri Yantra. 36 vertices originate in the layers above and below the XY plane. ELOHA, Godname of Geburah, prescribes them because its gematria number value is 36 (Table 2). 21 vertices and their 21 mirror images are in the XY plane. This shows how EHYEH, Godname of Kether with number value 21, prescribes the cross-section of the disdyakis triacontahedron viewed along a C-C axis. pair belonging to the shared root edge (Fig. 3). 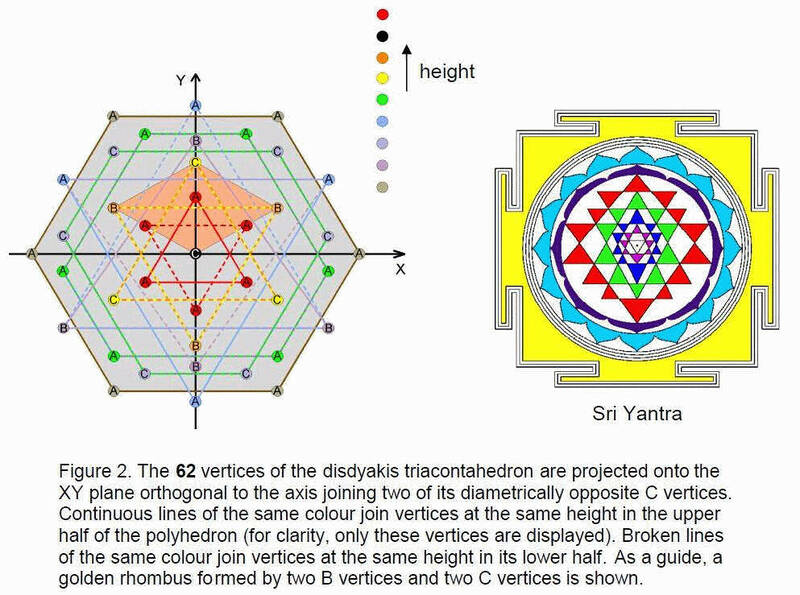 Hexagonal yods signify hidden degrees of freedom, and the 23 pairs are the minimal number of degrees of freedom needed to delineate the boundary of the pair of dodecagons — the Malkuth aspect of the Tree of Life corresponding to the human body. The pairing of chromosomes is signalled not by the pairs of hexagonal yods on each edge in a dodecagon but by the mirror image pair of dodecagons, so that there is in one dodecagon a mirror image counterpart of each yod in the other dodecagon. Consider the 15 polygons divided into their sectors. Table 3 lists the numbers of vertices, edges & triangles in the eight polygons in half the disdyakis triacontahedron. Table 3. Number of vertices, edges & triangles in the eight polygons. The first seven polygons have 108 geometrical elements surrounding their centres. The hexagon in the XY plane has 24 elements surrounding its centre. The eight polygons have (108+24=132) elements surrounding their centres. They comprise 33 vertices and 33 triangles, where 33 (=1!+2!+3!+4!) is the number of layers of vertices that are orthogonal to A-A, B-B and C-C axes.1 The total number of geometrical elements is 140. This is the number value of Malachim, the Order of Angels assigned to Tiphareth, and of Masloth, the Mundane Chakra of Chokmah (the Zodiac). It includes 41 vertices, where 41 is the 21st odd integer. This shows how EHYEH, the Godname of Kether with number value 21, prescribes the shapes of all the polygons orthogonal to a C-C axis. The eight polygons have 66 edges. As 66 is the 65th integer after 1, the Godname ADONAI with number value 65 prescribes the eight types of polygons. The two sets of seven polygons have (2×108=216) elements surrounding their centres, where 216 is the number value of Geburah, the sixth Sephirah. All 15 polygons have 60 vertices, 120 edges & 60 triangles surrounding their centres, i.e., 240 geometrical elements. This number is highly significant vis-à-vis the inner Tree of Life because it is the number of hexagonal yods in its seven separate polygons (Fig. 4). Moreover, the first three of these polygons have 60 hexagonal yods, comparing with the 60 vertices surrounding centres of the 15 polygons, the next three polygons have 120 hexagonal yods, comparing with their 120 edges, and the last polygon has 60 hexagonal yods, comparing with their 60 triangles. The correlation shows that the 15 polygons constitute a Tree of Life pattern. The 3:3:1 division of polygons generates the pattern of their vertices, edges and triangles. It reflects the fact that the seven Sephiroth of Construction are grouped in the Tree of Life as two triads and a single one — Malkuth. The superstring gauge symmetry group E8 has 240 roots and eight simple roots. The geometry of the 15 polygons embodies this group parameter describing the unified symmetry of superstring interactions. The centres of the eight types of polygons correspond to the eight simple roots. As each gauge field is 10-dimensional, the number of space-time components of the gauge fields corresponding to the generators associated with these roots is 2400. This was found in Article 272 to be the number of vertices, edges and triangles in the faces and interior of the disdyakis triacontahedron when the former are divided into three triangles and when the interior triangles formed by edges are likewise divided. The remarkable conclusion is that this polyhedron embodies the number of components of the 240 gauge fields of E8 associated with its roots, whilst the 15 polygons formed by its vertices embody this number of gauge fields. Table 4. Number of yods in the eight polygons (sectors as single tetractyses). the Sri Yantra that surround the central one. 26 vertices disappear, leaving (75–26=49) vertices. 26 is the number value of YAHWEH, the Godname of Chokmah, and 49 is the number value of EL CHAI, the Godname of Yesod. Now let us consider the triangular sectors of the polygons as tetractyses. Table 4 shows the numbers of yods in the eight polygons in one half of the disdyakis triacontahedron. There are 41 yods at the corners of their 33 tetractyses, 165 hexagonal yods and 206 yods altogether. The latter is made up of 34 vertices of the 27 tetractyses in the first seven polygons and 172 yods that are either hexagonal yods (165) or vertices of the tetractyses in the central hexagon (7). Compare this with the facts that the axial skeleton of the human body has 34 single bones and that 172 bones in the axial and appendicular skeletons exist in pairs (Fig. 5). The corners and centres of the seven polygons above the XY plane symbolise the single bones of the axial skeleton. It is truly remarkable that the bone composition of the body should be defined by the yods needed to construct the eight polygons in one half of the disdyakis triacontahedron from tetractyses! It is evidence that the human body is designed according to the blueprint of the Tree of Life, of which this Catalan solid is the polyhedral realisation. The 60 tetractyses in the 15 polygons have 60 vertices other than centres of polygons and 300 hexagonal yods, totalling 360 (=36×10) yods that surround their 15 centres. This shows how ELOHA, the Godname of Geburah with number value 36, prescribes the yod population of the 15 layers of vertices. The central hexagon also has 36 yods surrounding its centre. There are 10 triangles and five 6-sided polygons. The numbers 10 and 5 are the values of, respectively, the letters yod (י) and heh (ה) making up the Divine Name YAH (יה) with number value 15, demonstrating how it prescribes the layers of vertices in the disdyakis triacontahedron. Table 5. Geometrical composition of the eight polygons (sectors as three triangles). of its six tetractyses, showing how EL, the Godname of Chesed, prescribes the shape of the polygon in the middle of the 15 layers of vertices. 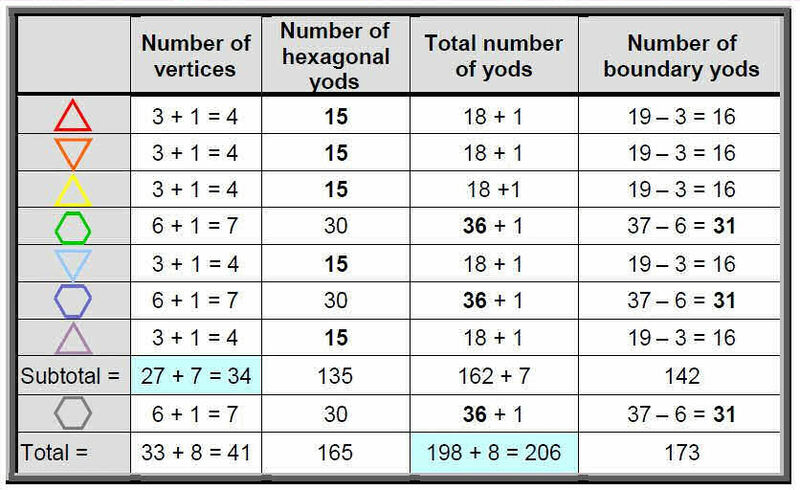 The 15 polygons have (284+31=315) boundary yods. Of these, 75 are vertices, leaving 240 hexagonal yods on the edges of tetractyses. We found earlier that the 15 polygons have 240 geometrical elements surrounding their centres. The two numbers agree because each sector of a polygon adds four geometrical elements, whilst, considered as a tetractys, it adds four hexagonal yods on the two edges associated with it. Both properties demonstrate that the number 240 characterises the shape of the 15 polygons. 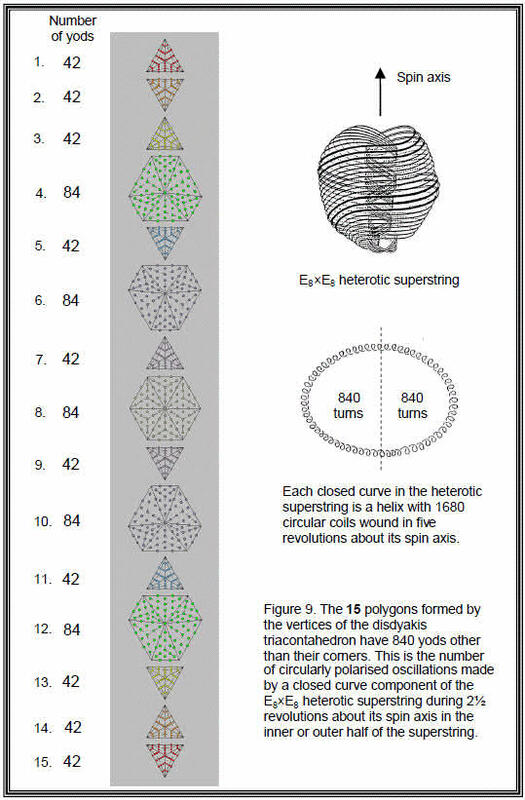 Many previous articles have discussed it in the context of the E8×E8 heterotic superstring, whose 16800 circularly polarized oscillations about its spin axis are the space-time manifestation of the 240 gauge charges associated with the non-zero roots of E8. Likewise, there are 240 geometrical elements surrounding the centres of the 15 polygons. The disdyakis triacontahedron embodies the structure of the superstring. Now consider the sectors of the polygons divided into three triangles. Table 5 lists their geometrical composition. The first seven polygons have 61 vertices of their 81 triangles. Both sets of seven polygons have 122 vertices. The hexagon in the XY plane has 13 vertices. The 15 polygons have (122+13=135) vertices. Including the two C vertices, the disdyakis triacontahedron has 137 vertices. This is the 33rd prime number, where 33 is the number of corners of the eight polygons in one-half of the polyhedron. Its reciprocal is approximately the fine-structure constant α ≡ e2/ħc ≈ 1/137 that measures the coupling of the electric charge of an electron to the electromagnetic field. One of the most important numbers in physics is encoded in the geometry of the 15 layers of vertices of this polyhedron! It is encoded in the inner Tree of Life as the 1370 yods in its 14 polygons when their 94 sectors are each constructed from three tetractyses (Fig. 6). that joins two diametrically opposite vertices.3 It is remarkable that the same number of geometrical elements should be displayed by both the polyhedron and its 15 layers. Table 6. 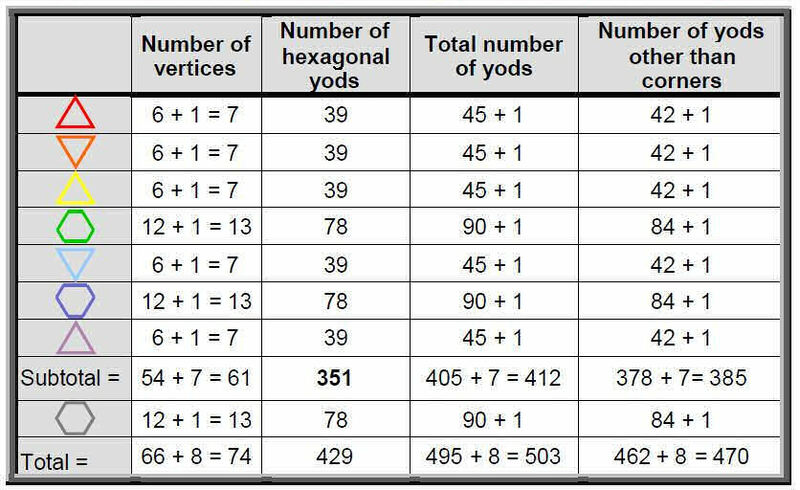 Number of yods in the eight polygons (sectors as three tetractyses). 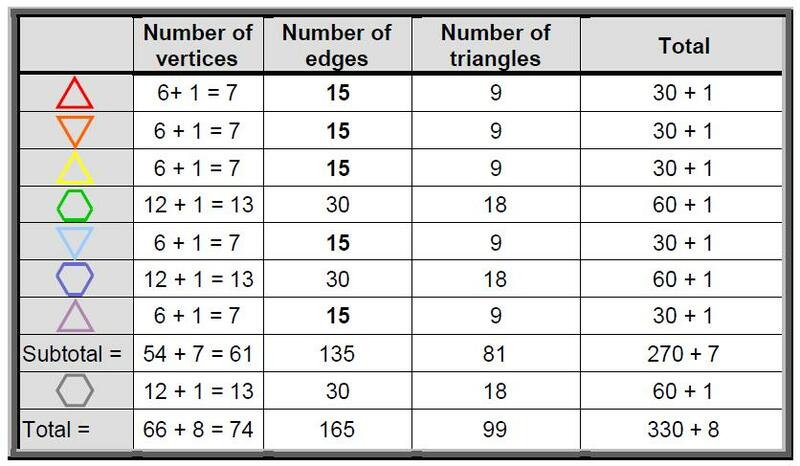 Table 5 also indicates that the eight polygons have 165 edges & 99 triangles, that is, 264 edges & triangles. This demonstrates that they constitute a Tree of Life pattern described by the structural parameters of the inner Tree of Life, whose seven enfolded polygons contain 264 yods when constructed from tetractyses (Fig. 7). Now suppose that each triangle is a tetractys. Table 6 lists the yod populations of the eight polygons. The 99 sectors of the eight polygons in one-half of the polyhedron have 74 vertices. Including the two C vertices, there are 76 vertices. This shows how YAHWEH ELOHIM, the Godname of Tiphareth with number value 76, prescribes the polyhedron through its 15 layers of vertices. The two 6-sided polygons above the XY plane have 26 vertices, leaving 50 vertices (two C vertices and 48 vertices of sectors). 26 is the number value of YAHWEH and 50 is the number value of ELOHIM. 351 = 1 + 2 + 3 + …. + 26. This demonstrates the mathematical beauty intrinsic to the disdyakis triacontahedron. The Decad determines the number of extra yods needed to construct the polygons in either half of the polyhedron above or below its central plane. properties of holistic systems. When the 180 interior triangles formed by the edges of the disdyakis triacontahedron are each divided into three tetractyses, they form 540 tetractyses. When its 120 faces are each divided into three triangles, they form 360 tetractyses. Therefore, the construction of the polyhedron requires (540+360=900) tetractyses. Remarkably, the same number of tetractyses creates the polyhedron as there are yods surrounding the centres of the polygons in its 15 layers! Earlier, we found that it also has the same number (600) of geometrical elements as the 15 polygons. 84 = 12 + 32 + 52 + 72.
have 378 yods other than corners that surround their centres. The 15 polygons have (378+84+378=840) such yods (Fig. 9). Remarkably, they have ten times the corresponding number in the central hexagon. This number is a structural parameter of the heterotic superstring, being the number of circularly polarized oscillations in an outer or inner half of each of the ten closed curves that comprise it. The arithmetic reason for this very important encoding of superstring structure in the 15 layers of vertices is simple. The number of yods in an n-sided polygon whose sectors are each divided into three tetractyses is 15n + 1. The number of yods other than corners of the polygon that surround its centre is 14n. The number of such yods in the 15 polygons = 14Σn = 14×60 = 840. The five 6-sided polygons have 30 corners and (14×30=420) yods other than corners, as do the ten triangles with 30 corners. This equal division of 420 yods is prescribed by the Godname YAH (YH) because the letter value 5 of H (heh) specifies the number of 6-sided polygons and the letter value 10 of Y (yod) specifies the number of triangles. It was shown in Article 27 that, when constructed from tetractyses, the disdyakis triacontahedron has 840 yods surrounding any axis joining diametrically opposite vertices.5 Once again, it is remarkable that the same yod population appears in both contexts. The 840 yods in the 15 polygons other than their 60 corners consist of 60 vertices of tetractyses and 780 hexagonal yods. Similarly, the 840 yods surrounding the axis of the disdyakis triacontahedron comprise 60 polyhedral vertices and 780 hexagonal yods. The same 60/780 composition of yods exists in each context as well. A 120:720 division in the number 840 occurs as well. The 15 polygons have (60×2=120) hexagonal yods along their 60 edges and 720 yods inside them. The latter comprise 360 hexagonal yods along the three edges inside each sector and 360 yods made up of 120 hexagonal yods along edges of sectors, 60 vertices and 180 hexagonal yods at centres of tetractyses. The disdyakis triacontahedron has 120 hexagonal yods at centres of its faces and 720 yods that comprise 360 hexagonal yods along its 180 edges and 360 yods made up of 120 hexagonal yods on 60 internal edges of triangles, 60 vertices and 180 hexagonal yods at centres of 180 internal tetractyses. Plato’s Lambda, the ratios of whose numbers have been known for over 2,000 years to define the tone ratios of the notes of the Pythagorean musical scale.6 If we consider its integers as denoting numbers of tetractyses, then the integer 6 denotes six tetractyses whose 60 yods correspond to the 60 vertices of the disdyakis triacontahedron, whilst the sum of its nine other integers is 84, and 84 tetractyses have 840 yods, which is the number of yods other than these vertices. This is intuitively appealing because, in terms of the equivalence between the Tree of Life and the tetractys, the central yod symbolizes Malkuth, so that the 60 vertices in the 15 polygons constitute the Malkuth aspect of the disdyakis triacontahedron as the polyhedral Tree of Life as they create its form, whilst the other yods constitute its higher aspect. The Lambda Tetractys was encountered in a previous article7 in the context of the disdyakis triacontahedron as the 900 tetractyses needed to build its faces and interior triangles when each one is divided into three tetractyses. The 120 faces comprise (120×3=360) tetractyses and the 180 interior triangles formed by its 180 edges comprise (180×3=540) tetractyses. The former correspond to the sum (36) of the integers at the corners of the Lambda Tetractys and the latter correspond to the sum (54) of the integers at the centre and corners of a hexagon. Both the disdyakis triacontahedron and its 15 layers of polygons conform to the archetypal pattern of the Lambda Tetractys. 360 yods correspond to the integers at the corners of the Lambda, whose sum is 36, whilst the ten triangles and the central hexagon correspond to the seven remaining integers, whose sum is 54.
hexagon (Fig. 11), as one would expect, intuitively, as the corners are the shape-defining yods, a quality consistent with the meaning of Malkuth symbolized by the yod at the centre of a tetractys and therefore with the number 6 that occupies this position in the Lambda Tetractys. The hexagon in the XY plane with A vertices at its corners is therefore analogous to the complete set of 15 polygons. As found several times earlier, the properties of the latter are exactly ten times the corresponding ones of the former. The whole is contained in another whole. The simple, arithmetic reason for this is that the central hexagon has six sectors, whilst the 15 polygons have 60 sectors, that is, ten times as many, so that any property of the sectors of the hexagon become multiplied by 10 for the corresponding properties of the complete set of polygons. 1 Phillips, Stephen M. Article 25: “The 33 Vertex Sheets of the Disdyakis Triacontahedron Signify the 33 Tree Levels of Ten Overlapping Trees of Life,” (WEB, PDF). 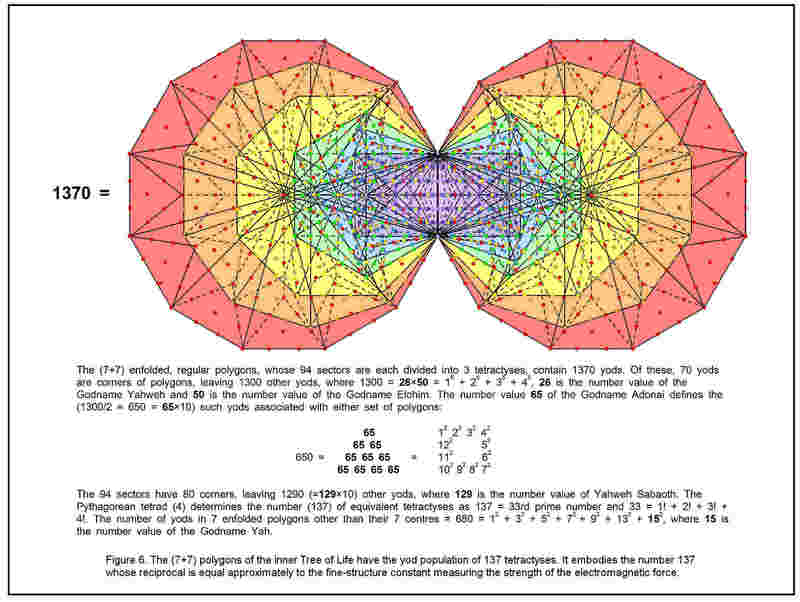 2 Phillips, Stephen M. Article 27: “How the Disdyakis Triacontahedron Embodies the Structural Parameter 1680 of the E8×E8 Heterotic Superstring,” (WEB, PDF), pp. 4–5. 3 Ibid., p. 20, Table 4. 4 Phillips, Stephen M. Article 1: The Pythagorean Nature of Superstring and Bosonic String Theories,” (WEB, PDF), p. 5. 5 Ref. 2, p. 19. 6 Phillips, Stephen M. Article 11: “Plato’s Lambda — Its Meaning, Generalisation and Connection to the Tree of Life,” (WEB, PDF), and Article12: “New Pythagorean Aspects of Music and Their Connection to Superstrings,” (WEB, PDF). 7 Phillips, Stephen M. Article 26: “How the Seven Musical Scales Relate to the Disdyakis Triacontahedron,” (WEB, PDF), p. 29.